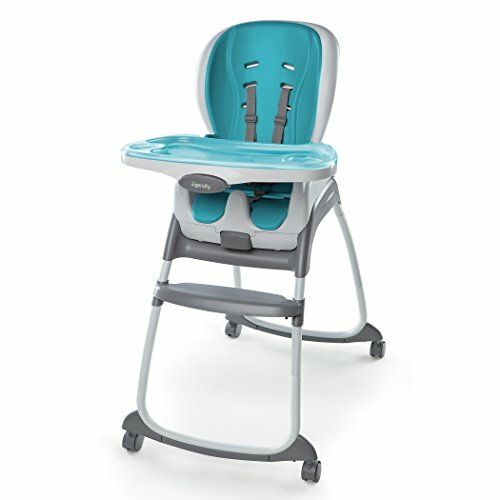 Ingenuity's Trio 3-in-1 Smart Clean High Chair is every chair baby will ever need because it's three chairs in one. Three modes of use include a full-size high chair, booster seat, and toddler chair. The soft foam seat pad adds extra comfort for baby, wipes clean instantly, and is even dishwasher safe. The Easy Clean tray removes with one hand, is dishwasher-safe, and features four locking positions to grow with baby. The high chair and booster seat include a five-point harness and the toddler chair has a three-point harness to keep baby secure. The Trio Smart Clean has three recline positions to accommodate a growing baby and toddlers up to 50 pounds. When used as a booster and toddler chair, it can even seat two children at the same time. Designed with parenthood in mind. The soft, padded seats wipe clean in seconds, and the tray can be removed with one hand and popped in the dishwasher for quick cleaning. Let the purees commence!